Till now, if you traveled abroad and wanted to use a local SIM card to your Swisscom phone it was not possible because of the lock. Without the lock this would be possible, the official communication also reminds something I was not aware of, since the beginning of 2011 Swisscom is the first provider in the country which doesn’t auto-renew´s the contract´s, giving the user more options to renew or just leave the company. You can find the original statement of the company on the following link. 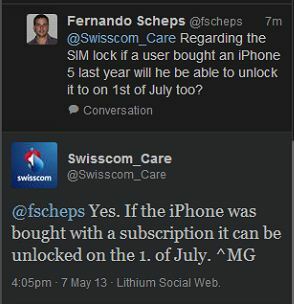 If you are a Swisscom user and want instructions on how to unlock your device, check out this link. The company is owned almost 57% by the Swiss Government, located in Worblaufen near Bern (the Swiss capital), Swisscom holds 62% of the mobile phones market in Switzerland since the year 2000 and its market share didn’t change much although there are 2 other companies competing on the segment (Sunrise 21.4% and Orange 16.6%) way back from the leader.